The roots of America's aversion to midwifery go back to the late 1800s, when the advent of germ theory and anesthesia reduced much of the danger and discomfort associated with childbirth. The benefits of these technologies brought doctors to the forefront of maternity care and pushed midwives aside. Obstetricians helped to bar midwives from practicing in hospitals, which were now considered the safest birth settings. By the early 1960s midwifery was virtually obsolete. It has made a comeback since then, with practitioners just as well trained as doctors to supervise uncomplicated deliveries. Studies show that midwife-attended births are as safe as physician-attended ones, and they are associated with lower rates of C-sections and other interventions that can be costly, risky and disruptive to the labor process. But midwifery still remains on the margins of maternity care in the U.S.
To bring it back into the mainstream, midwives must be fully integrated into the medical system. Some states currently refuse to recognize them as legitimate practitioners, and some severely limit what midwives are allowed to do, despite evidence that states with the most restrictive policies also have some of the highest rates of adverse birth outcomes, such as deaths of newborns. If midwives were allowed to work alongside other providers, patients would get the care advantages, and if difficulties arose, a woman whose home birth suddenly became complicated could be seamlessly transferred to a hospital. . . .
ou might be surprised to learn that in the United States a woman coping with the heartbreak of losing her pregnancy might also find herself facing jail time. Say she got in a car accident in New York or gave birth to a stillborn in Indiana: In such cases, women have been charged with manslaughter. There are a gazillion (OK I exaggerage) mico-organisms that live and breathe in the human body, making sure it stays on healthy track and influencing heavily not only each unique child'd future but the future of nations and the world. Unfortunately, high rates cesarean deliveries in the United States and less than 100 percent breast-feeding rates have impacted the gut biome of a significant number of baby’s -- a scenario that research shows has lead to long-term health issues in children and adults, including asthma, allergies, celiac disease, Type 1 diabetes and obesity. Check out thei fascinating -- and scary -- article publishing in the New York Times this month by wrtier Jane E. Brody. Definitely gives us something to think about. Not all babies can breastfeed or be arrival via the vaginal canal. But are we doing all we can to protect the precious gut biome that determines a baby's future heath? Click on the article title below to read more! It is always reassuring to read studies that show with confidence what your friends, midwife and other providers have been telling you: acupuncture works. Especially if you have lower back and pelvic pain, which are common in late pregnancy. Take a look at what researchers who published in the journal of obestetrics in Scandanaia. To purchas the full article click here. Background. The study was designed to evaluate the analgesic effect and possible adverse effects of acupuncture for pelvic and low-back pain during the last trimester of pregnancy. Methods. Following individual informed consent, 72 pregnant women reporting pelvic or low-back pain were randomized during pregnancy weeks 24–37 to an acupuncture group (n = 37) or to a control group (n = 35) at three maternity wards in southern Sweden. Traditional acupuncture points and local tender points (TP) were chosen according to individual pain patterns and stimulated once or twice a week until delivery or complete recovery in acupuncture patients. Control patients were given no sham stimulation. Throughout the study period each patient made weekly visual analog scale (VAS) evaluations of maximal and minimal pain intensity as well as three-point assessments of pain intensity during various activities. Results. During the study period, VAS scorings of pain intensity decreased over time in 60% of patients in the acupuncture group and in 14% of those in the control group (p < 0.01). At the end of the study period, 43% of the acupuncture patients were less bothered than initially by pain during activity compared with 9% of control patients (p < 0.01). No serious adverse effects of acupuncture were found in the patients, and there were no adverse effects at all in the infants. Conclusion. Acupuncture relieves low-back and pelvic pain without serious adverse effects in late pregnancy. So you just bought a new fancy schmancy smart phone and you can’t wait to see how smart it really is -- especially given those billboards you see all over town promising that it will take the BEST photos EVER of your favorite restaurant dishes, your dog, and your brand new baby. #1 Take Photos During the Day -- Especially Indoors. Yes, your new phone has a flash. And you could use the flash. People Do. But the truth is, they always hate those photos. That's because taking pictures in the dark, even with a flash, often results in ugly red-eye, harsh, unwanted shadows, garish skin tones and tons of grain. Not to mention, cranky, startled babies! So instead of sub-par night shots, look for the the daytime sun spots around the house -- they will change throughout the day as the light moves around your abode though windows or other light sources. Indirect light is best -- through a window for example or one of those IKEA lamps that directs light upward to bounce off of the walls or ceiling to light the room. Be sure to face your baby toward the light. For example if lush light is wafting through the window in the living room, face your baby toward the window to get the best lit shot. Follow the light in your house. Usually face the baby toward the window or light source. In this case we have shot the photo with the baby in front of the window to create a silouette and halo. #2 The Best Outfits Are Simple and Comfortable. Dress that baby in SIMPLE clothes and colors -- no strips, dots, logos! Unless you are trying to capture your baby climbing a palm tree like a baby sloth, don't shoot with the camera in the vertical position. Photos taken in the horizontal (wide) position are best and give ample space to catching your baby in action -- reaching, waving, stretching out. And don't forget to zoom in now and then, close up on his face or her tiny foot or hand. Stay horizontal, unless you like tall skinny photos. There is nothing more counter-productive (or forced) than telling someone to smile for the camera. Instead think of something else to say, anything else, whether the subject of your photos is a baby or a grown up. Get their attention with a joke or a surprise word or move and help them smile spontaneously! Be imaginative. Use humor. Do something silly. For a baby, Peek-a-Boo works EVERY TIME! Shoot quick -- that real smile is fleeting. You've got to get that shot before your subjects (at least the older ones) realize they are on camera and return to the fake, forced smiles. Break your camera screen into thirds horizontally and vertically. Try to get your baby's face into any one of those thirds but the middle one. That middle square makes it a mug shot. The others make it art! Here's the technical meaning of this phrase (thank you wikipedia): The rule of thirds is applied by aligning a subject with the guide lines and their intersection points, placing the horizon on the top or bottom line, or allowing linear features in the image to flow from section to section. The picture on the left is BAD. See the rock right in the middle of the phone? The picture on the right is following the rule. It's more interesting. By placing the rock in an outer third it the eye is led into the photo. Rule of Thirds: This baby's face follows the rule! It is in the top right third of the frame. Oops we it's vertical but we're above this cute baby! You have that sweet little thing in front of you and it's easy to forget your are bigger and taller than the baby! Shoot from above. Put your baby in a basket and shoot down at her. A lot of professional photographers will climb up on a ladder and literally shoot down at those little angels you see on calendars. If you DO climb up on a ladder over your newborn, of course exercise common sense. Be sure someone is holding the ladder. And of course be sure you have your smart phone attached to your body somehow. someway -- by lanyard perhaps or taped to your palm if needbe. She's not going to smille if you drop your smart phone on her super smart brow. Getting above your baby truly makes for some awesome newborn pictures! Back up your phone frequently and make sure you print the photos you capture on your phone. Making printing a monthly task. Put it on your calendar and set aside and hour to gleen and pick and sent to print. Consider creating a photo book. A simple Google of Photobooks will give you lots of easy options for creating and printing photobooks online. Premature babies often need time to grow in incubators. Pre-eclampsia, a condition in which the mother's body mounts an exaggerated inflammatory response, affects up to 8 percent of all pregnancies, and can lead to severe complications for both mother and baby. A growing body of evidence suggests that the mother's diet influences the outcome of pregnancy. And previous research has suggested that probiotics -- live bacteria and yeasts thought to promote good health -- might reduce certain complications of pregnancy. Among the 34,458 women included in the premature birth analysis, 2858 babies were born early, some 1795 of which were spontaneous premature births, and 1065 of which were iatrogenic -- in other words, caused by the consequences of medical treatment. The amount of probiotic consumed didn't seem to make any difference, the findings showed. Nevertheless, they conclude: "If future randomised controlled studies support a protective effect of probiotic consumption on reduced risk of pre-eclampsia and preterm delivery, recommending [it] would be a promising public health measure to prevent these adverse pregnancy outcomes." Skullcap -- an herb that may help reduce anxiety and stress during the postpartum period. No woman should have to suffer in silence. You simply may be one of millions of women whose hormomes and the unhealthy work-focused push of our society have manifested in a very real syndrome. That said there are natural ways to approach PPMD. The following herbs and supplements may help and have been found to be safe while breastfeeding as long as you are taking them under the advisement care of a medical or naturopathic doctor.. NOTE: Before you take any of the following, consult with your doctor and a reputable, certified doctor of Chinese Medicine or Certfied Herbalist. Don't dose yourself by guessing. Vitex helps to balance the hormonal cycle. Sun. Yes, sit in the sun a lot (with sunscreen of course). Sun is loaded with Vitamin D, lack of which is definitely indicated in ALL mood and depression issues, not just postpartum mood concerns. The probiotic Lactobacillus reuteri may help treat colicky breastfed babies less than 3 months old, report researchers. An international study has found that a specific probiotic group is twice as likely as a placebo to reduce crying by 50 percent after three weeks of treatment for colicky babies who are exclusively breastfed. The condition, which affects one in five families, is most common in babies less than three to four months old—and typically goes away over time, but that doesn’t make it any less frustrating and distressing for new parents. There’s been no effective treatment for colic. The Murdoch Children’s Research Institute led the study on the probiotic Lactobacillus reuteri DSM 17938. 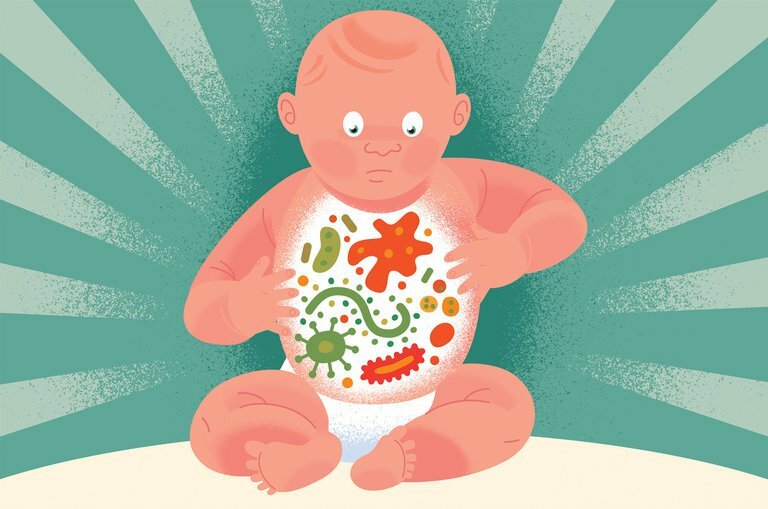 Valerie Sung, the lead author and pediatrician, says many studies have looked at the role of probiotics in treating colic, but this particular strain shows promise. Although previous studies of Lactobacillus reuteri for infant colic have shown conflicting results, this collaborative study confirms that Lactobacillus reuteri is effective in reducing crying in breastfed babies with colic—although conclusions cannot be drawn for formula-fed babies. “Families of exclusively breastfed babies with colic now have an option of trying something that may help, whereas in the past, there really was no effective option available,” says Sung. The study, published in Pediatrics, combines raw data from four major high-quality, double-blind, placebo-controlled Lactobacillus reuteri trials, in Italy, Poland, Canada, and Australia. The team worked together to analyze data from 345 babies less than three months old with colic. It is the first and largest analysis of Lactobacillus reuterifor treating infant colic, and the results were compared with babies who received a placebo. Lactobacillus reuteri is the most commonly found lactobacillus species in the human gut, though not always and often in relatively low numbers. Animal studies indicate that it may change pain perception in the guts of rats, modulate how the gut contracts, and increase the protective effects of the mucus layers of the gut. Both human and animal studies have shown it can reduce gut inflammation and kill bacteria, or stop their unwanted effects. Interestingly, the probiotic has the ability to inhibit the bacteria E. coli—which has been shown to be more abundant in the guts of babies with colic than those without. Sung, an honorary fellow at the pediatrics department of the University of Melbourne, led the Australian part of the trial. It was the largest trial and the only one to include both breastfed and formula-fed babies. It took place in 2011 and included 167 babies with colic. At that time, researchers found that Lactobacillus reuteri was ineffective. However, when this information was combined with the three other international trials, it seems Lactobacillus reuteri is effective for babies with colic who are exclusively breastfed. “Because of the controversial results, we decided to team up with the other researchers from the other three high-quality trials to combine the data, creating more power and accuracy in determining the probiotic’s overall effectiveness,” says Sung. And while the study is hopeful, the lack of studies on formula-fed babies mean it’s not necessarily an automatic cure. “Unfortunately, I am not aware of any trials to examine the probiotic’s effectiveness for formula-fed babies with colic. This is a challenging area of research, because nowadays, many baby formulae have added probiotics and prebiotics which can potentially contaminate research results,” she says. According to Sung, the effectiveness of this treatment will require assessment on a case-by-case basis. But for new parents struggling with a colicky newborn, it may help. “Having been a parent of a crying baby, I know that a few minutes of crying can seem an eternity, let alone more than three hours of crying a day,” says Sung. “For any parent worried about their baby’s crying, it is important to seek help from their local doctor. Once the doctor has made sure there is no medical reason for the baby’s crying, then a three week trial of the probiotic Lactobacillus reuteri may be helpful for babies who are breastfed. The International Scientific Association for Probiotics and Prebiotics supported the work. Creative Commons License: You are free to share this article under the Attribution 4.0 International license. How Does Your Hospital Rate on the C-Section Question? Consumer Reports Reports!! If you are having a baby in a hospital, you should care about the number of surgical births that hospital conducts each year as well as the stated reasons for those Cesareans. Why? Because your chance of it happening to you and your baby goes up right along with your facility's numbers. Consumer Reports recently released it's latest survey of hospitals C-section and safety rates. Click on the map above to get to the survey results. Counting kicks is easy to do. It's important too! According to the information posted at CounttheKicks.org, counting can save your baby's life. When you start your 3rd trimester, it’s time to start counting. Pick your time based on when your baby is usually active, such as after a snack or meal. To get started, sit with your feet up or lie on your side. Count each of your baby’s movements as one kick, and count until you reach 10 kicks. After a few days you will be to see a pattern for your baby. Log your recorded times using our Count the Kicks App or a kick chart. Holm Tveit JV SE, Stray-Pedersen B, Bordahl PE, Flenady V, Fretts R, Froen JF: Reduction of late stillbirth with the introduction of fetal movement information and guidelines - a clinical quality improvement. BMC Pregnancy Childbirth 2009, 9(32). Fourteen hospitals in Norway participated in this study which aimed to improve care by providing written information to pregnant women about Decreased Fetal Movement and to provide guidelines on Decreased Fetal Movement to health care providers. There was an overall decrease of stillbirths by 1/3, with no increase of preterm births, or need for neonatal care. Guidelines for Perinatal Care, 6th Edition, 2007, American Academy of Pediatrics and American College of Obstetricians and Gynecologists, page 114 (under paragraph entitled Assessment of Fetal Movement): "The perception of 10 distinct movements in a period of up to 2 hours is considered reassuring. After 10 movements have been perceived, the count can be discontinued for that day." 5000 moms with stillbirths participated in answering questions regarding their pregnancy. 50% of the moms reported gradual decreased fetal movement several days prior to death. 56% of moms reported that this decreased movement was the first reason to believe that there was something wrong. FEMINA8 (Fetal Movement Intervention Assessment) is an ongoing international research collaboration to improve pregnancy outcome through better understanding of reduced fetal activity. Froen previously reported that 50% of mothers waited more than 24 hours without any fetal activity before contacting their doctor – 30% waited more than 48 hours. Dr. Uma Reddy from the National Institute of Health (NIH), is leading the Stillbirth Collaborative Research Network (SCRN). This 5 year study will determine the incidence of stillbirth, determine risk factors and uncover the causes of stillbirth using a standard protocol that will review clinical history, protocols for pathologic examinations of the fetus and placenta. It’s a great way to bond with your baby. Most importantly, it could save your baby’s life. I was listening to NPR the other day when I heard this story about the new book by political scientist Courtney Jung, Lactivism. Throughout the interview, Ms. Jung made statements that made my blood boil. While there may be bits of research out there that question the advantages of breastfeeding, the vast majority of it supports nursing as highly beneficial to both mother and baby. That does not mean every woman can or should nurse and I don't know many breastfeeding advocates who believe that every woman should or can. In 20 years as a birth worker, I have rarely seen the kind of pressure that Ms. Jung describes being exerted on women to nurse at all cost. Generally I see the opposite. Women are encouraged to try it (after generations of being told not to) and then given very little support to continue if or when it gets rough. The book and Ms. Jung's statements are often misleading non-science and opinion. I found the NPR conversation with Ms. Jung decidedly one-sided. What are your thoughts? After just a couple of days on bed rest, the material of your body begins to feel different: softer, heavier, a burden to the bone beneath. The thud of the heart in the chest feels deeper: each beat shifts your frame a little. Even though you haven’t used your back for anything, it aches — and when you twist into a new position the ache swivels along with the muscles, can’t be left behind. You fall asleep throughout the day but can’t sleep through the night, and when you bend a limb at the joint, it’s not the transparent sensation you’re used to — you can feel the muscles tugging, the socket creaking in protest. Your body becomes more present, weaker, and more vulnerable: you are aware of it as though it were an alarm that has not yet gone off but could at any moment. This summer, I checked myself into a progressive Catholic convent in the Pacific Northwest to observe the effects of five days of bed rest on my body and mind. My plan was to spend all but thirty minutes of each day in a small room with framed Bible verses on the walls, lying on my back or side on a spartan twin-size cot. In the thirty minutes I was allowed out of bed, I would shower, take bathroom breaks, or fetch food from the communal kitchen to bring back and eat in bed. In the final moments before my experiment began, I stretched the inner muscles of my thighs and blinked in the warm sunlight. I tried to take pleasure in feeling ordinary, normal, mobile. Though five days is a relatively short bed-rest regimen, the first week is when some of the most dramatic changes to the body occur. Deconditioning of the cardiovascular system begins within forty-eight hours. The amount of circulating blood decreases, the heart’s total output drops, and the body uses less and less oxygen. Within five days of immobilization, the arteries narrow and stiffen, and the interior lining of the blood vessels becomes less able to flex and tighten. The body scales itself down rapidly to meet the reduced physiological demands of its new state and then pauses. Eventually, over weeks, bone density decreases and muscle volume declines. Actin and myosin, the proteins that make up muscle, break down into free-floating nitrogen that is flushed from the body through the kidneys. Simply standing up can cause fainting, since the body is no longer used to pumping blood against the pull of gravity. Hundreds of thousands of years of evolution have enabled us to walk upright, a task few other mammals can manage — sheep and rabbits often lose consciousness or die when held vertical. But the more time a body spends away from plumb, the greater its difficulty in readapting to normal life. For this reason, bed rest is used as an analogue for space travel in NASA experiments: the effect of weightlessness on human bodies can be simulated on Earth by putting subjects to bed at a six-degree negative incline. Prolonged rest is an extreme physiological challenge, a new environment for the body to navigate. What I’ve described sounds like a sort of bodily erosion, a slow injury or gentle decay, but it also happens to be one of the most commonly prescribed treatments in the United States for pregnant women at risk of preterm birth. Each year as many as 700,000 pregnant women are prescribed some form of bed rest: from several hours a day to round-the-clock immobilization with breaks only to use the bathroom. For some types of high-risk pregnancy, the mother-to-be is hospitalized and prohibited from getting up to relieve or clean herself, from standing, or even from sitting propped up in bed. Strict bed rest — whether at home or in a hospital — often means that a woman has to forfeit exercise, income, and normal domestic tasks such as caring for her family or maintaining her home. The practice continues despite a growing body of clinical evidence showing that strict bed rest offers no benefits to the fetus or to the mother. It has not been proved effective in treating gestational hypertension, preeclampsia, a shortened cervix, spontaneous abortion, or impaired fetal growth. The hazards of bed rest, on the other hand, are well substantiated: patients may suffer from bone loss, blood clots, muscle atrophy, weight loss, and psychological malaise. Enrollment in one study, in which women carrying twins were randomly admitted to the hospital for bed rest or assigned outpatient care with no activity restriction, was halted midway because of concerns about a possible detrimental effect to the hospitalized group. Even so, bed rest remains a routine therapeutic intervention for pregnancy, with up to 95 percent of obstetricians reporting that they’ve prescribed it for their patients. Decades after the treatment fell out of favor for other conditions, pregnancy is the last remaining medical territory to which bed rest can lay claim. It is now the domain of those physi cally incapable of movement — those, for example, who have broken all their limbs — and expectant mothers. "There is the way you picture your birth going, and then the way itactually goes, and rarely are those two the same. But the premise of a new documentary called The Mama Sherpasis that maybe, perhaps, our country can inch toward a model where mothers work with both midwives and doctors to have births that are more comfortable, calm, and less of a surprise than, say, the emergency C-sections we so frequently hear about, or the induced births. Because the documentary is executive-produced by Ricki Lake and Abby Epstein, the team behind The Business of Being Born (and the executive producers of the documentary Breastmilk) I first thought The Mama Sherpas might be another championing of home births and natural-everything. But it's entirely focused on several medical centers where doctors and midwives work side-by-side, in medical settings. There is always an emergency team on the premises if needed, which is reassuring as you watch, for instance, a woman attempt (successfully!) a vaginal breech birth. Related: Is a Certified Nurse-Midwife Right for You? The film chronicles plenty of mamas' labors—yes, there is a C-section, and yes, there is a water birth, and everything in between. The director, Brigid Maher, was motivated to do the film on her quest for a VBAC, a vaginal birth after having had a Caesarean, and she is entirely understanding of the fact that there is a time and place for every kind of medical intervention. Her objection is to women being pushed into a birth they don't want strictly for the convenience of the doctors and hospital staff. And her love of midwives seems to come from the fact that they are able to devote more time and patience to educating their clients, explaining when something is necessary and when it is a choice. The takeaway, if you're pregnant or planning to have another baby, is that finding a midwife who will assist your birth is, at the very least, likely to give you more options than you would probably have working only with doctors and nurses whose job is to standardize the births they facilitate. Use the firm to be inspired to ask questions, and to appreciate that perhaps we can all have a little more control of our births than we think. It will be available on DVD ($19.99) and iTunes($4.99 to rent) tomorrow, July 21. In the meantime you can watch the trailer or check them out on Facebook to follow the rollout of the film." Jessica Hartshorn has been an editor at American Baby magazine for 17 years and yet is still sort of shocked when watching video footage of babies being born. swelling, bleeding on the surface of the brain and bleeding behind the eyes. than shaking, and having nothing to do with criminal behavior, may sometimes explain the triad. stories of the past and their enduring consequences. had been shaken violently, his head hitting some hard surface. 279 days. Many in Massachusetts and beyond were outraged. Nonetheless, Ms.
Woodward was free to return to England. United States, or four a day, died from various forms of abuse or neglect. syndrome,” Dr. Barnes told Retro Report. is about to shake a roomful of babies to see what happens? cleared of charges that he had violently shaken his 3-month-old son to death. that abusive head trauma is supported by decades of observation. syndrome is applied too loosely in some criminal cases.